Boy, have I got a humdinger of a veggie side dish for you! 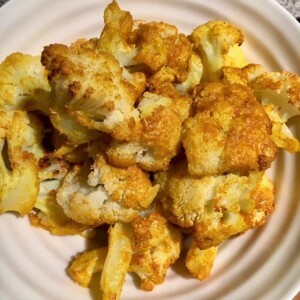 Cauliflower is one of my food loves, and I am always searching for new ways to jazz it up. This recipe comes courtesy of Nashville’s Laura Lea, Certified Holistic Chef (www.llbalanced.com). I’ve whipped this up a few times for friends, and even my so-called ‘cauliflower haters’ are sold on it! Preheat oven to 400 degrees F, and cover a large baking sheet with parchment paper. In bowl, whisk tahini, olive oil, turmeric, and salt. Cut cauliflower into florets and add to bowl. Mix until all florets are well-coated (use your hands if you wish!). Place florets in a single layer on baking sheet. Bake 30-40 minutes, or until cauliflower is golden brown. As if deliciousness wasn’t enough, here are some happy facts about the nutritional value of this dish. Turmeric – this deeply yellow-pigmented spice’s bio-active ingredient is curcumin, which has been used for thousands of years in traditional Chinese and Ayurvedic medicines. It boasts anti-inflammatory, anti-microbial, and anti-cancer properties. Turmeric/curcumin has been vigorously studied and science confirms its pro-health capacity, from supporting healthy cholesterol levels to suppressing rheumatoid arthritis symptoms to positively modulating over 160 different physiological pathways. Quality organic turmeric/curcumin extract can also be found in supplement form. Tahini – this delicious, thick, nutrient-dense sesame seed paste brings a burst of B-vitamins, which help with cell growth and division, support metabolism, and enhance immune function. A mere tablespoon brings us over 30% of the recommended daily allowance of calcium, in very easily-digestible form.